Mark Magnacca discusses one thing that can dramatically increase a salesperson's success while in-front of a prospect. Mark is the author of "So What?" and President and Founder of Allego, Inc. 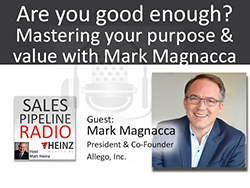 Listen in to see why practice for sales professionals is so important and as Matt and Mark ask the question-- "Are you good enough?". Insight Development Group specializes in training clients to create crisp, concise and compelling reasons to set themselves apart from their competitors. By creating a personal brand and effectively articulating their value proposition, clients of Insight Development Group gain a huge competitive advantage and accelerate the sales process.